Ms. Adam set Ketubah to music from The Best Little Klezmer Band’s CD, Schleppin’ West. The result is a dramatic tale of an arranged marriage that follows the bride and groom from their first childhood game of musical chairs to the stomping of the wedding glass as the universal shouts of “mazeltov” ring out to the heavens. The songs that provide the live sonic backdrop at each Houston Ballet production include Esther’s Dream, Nie Serdis/Moya Tziganotchki (Don’t Be Angry/Gypsies), Bubbe’s Dreidel (Grandma’s Spinning Top), Kinder Yorn (Childhood Years), L’Shmoa (Hear Our Prayers), Invitation to Dance, and Chusn-Kaleh, Mazeltov! (Congratulations Bride and Groom). 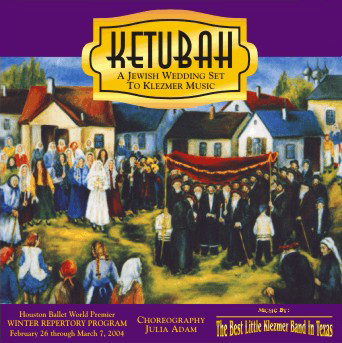 CD cover is taken from an exquisite oil painting called “A Wedding” by artist Ibby Kleiner who has generously granted permission to The Best Little Klezmer Band for its use. For more information about Ketubah and The Best Little Klezmer Band in Texas visit www.texasklezmer.com or www.houstonballet.org. Try to escape the infectious spirit and high energy of klezmer music: you'll find it irresistible! This unique musical style combines the haunting, lyric melodies of Eastern European Jews and Gypsies, the boisterous sound of Russian folk dances, and American jazz and swing rhythms of the 1920s and 30s. Together, they produce an electrifying world music that challenges you to remain in your seat. Interspersing this music with a fascinating description of the customs and culture of the creators of klezmer makes the program as educational as it is entertaining. With the virtual destruction of Eastern European Jewish culture during the Holocaust comes the inevitable question: "How could such devastation occur and could it happen again in our lifetime?" Civilizations lacking the ability to respect the humanity of "the other" cannot help but breed intolerance and allow scapegoating of minority populations to prevail. There Once Was a Town recreates pride for the beauty of European Jewish cultural heritage by revitalizing the 400 year-old musical tradition of a bygone era through dynamic characterizations of Klezmer's electrifying and spirited world-beat. The artists intersperse their high-energy performances with a fascinating multimedia portrayal of the music, language, and customs of the once vibrant Eastern European Jewish culture. The program is divided into three parts: Part One portrays the vibrancy of Eastern European Jewish culture (traditions and customs) prior to the events leading up to World War II; Part Two introduces content relating to the rise of Nazism and its effect on European Jewish culture; and Part Three relates to the American Jewish immigrant experience. The concept of the program is unified by integrating live klezmer instrumental and vocal music and dialogue with archival video footage. 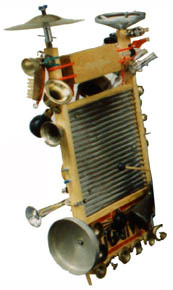 You can find everything you need to build your own "Klezboard" in Grandma's attic or at your local 'Five & Dime'. We'll show you how to build it and teach you how to play it. You can even sit in with the band! Do you know how to dance a Yiddish Rumba or the Russian Sher? We'll teach you all the oldies plus the newest "Simcha" dances guaranteed to make your next party a huge hit!! 1. Stage Area - Presenter must arrange for a clean, clear, space for the bandstand. The band requires a space not smaller than 12' deep by 16' wide, unless otherwise arranged. A working electrical outlet must be provided in the performance area, and lighting (sufficient for reading music) should also be arranged by the CLIENT. 2. Acoustic piano (tuned)- Grand piano preferred. Upright or consol okay. 88 keys, touch sensitive/simulated piano action, pedals, PLUS amplifier. 3. Projection Screen• (drop-down or portable) and Audio-Video Tech to run sound and video footage. •only required for "There Once Was A Town" show. 4. Prop Table: minimum size 18 x 36 inches. 5. Acoustic* (upright) Bass with electric pick up and bass amplifier. 6. Sound System* - 2 speakers + cables, one 8-channel mixer, 4 Shur SM58 mics + mic stands w/boom arms + mic cables, 3 monitor speakers. * If venue is outside of Houston area, presenter may be asked to provide bass, drums, and/or sound system for band's use. ** Ludwig, Tams, Pearl, Premiew, Yamaha, DW & Rodgers are suitable professional quality drums, and Zildjian, Sabian & Paiste are suitable quality cymbals.